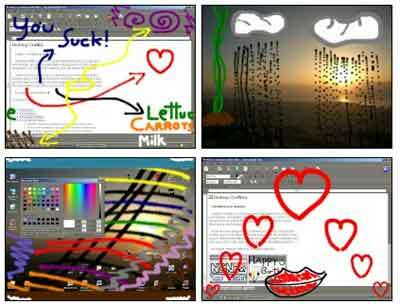 Desktop Graffitist is a cool application for fun with anything on your desktop. It allows you to spray paint on desktop and create Graffiti aka Desktop Graffiti. This little application is good enough for your creative release and for some fun while working (or sitting idle). Using this is really easy, just ‘Left-click’ and drag the mouse to spray the paint on desktop. You can switch between differentÂ colors by scrolling mouse wheel or pressing ‘1’ key to ‘0’ for 10 available colors. Use ‘+’ or ‘-‘ keys to enlarge or reduce the dispersal pattern. After you are done with play you can save the graffiti creation by pressing the Print Screen key (then open MS Paint and goto Edit > Paste). Otherwise you can press ESC key and exit the fun play Graffiti session. Download Desktop Graffitist for some Graffiti fun and creativity! I like Graffti and I like my desktop. So merging both will be a lot of fun..